← We found our Online Cookie All Star for Spring 2011! “Be prepared” is a motto that we like use in Girl Guides and this adorable rookie seller made sure she practiced her sales pitch to perfection. Our media-savvy girls are always ready for interviews! Sarah and Mykala took the mic at CJAY 92 Radio in Calgary and breezed through their interview. As all professionals know, presentation is key and Andrea G. took this to heart as she perfected her look for her cookie-selling debut with Trefoil nail art. When Cookie Day @ Sears finally came, our girls brought their A-game (smiles and cookies included) to Sears stores nationwide for your donations and enjoyment. We’ve put together a small slide show of our girls in action! 1st time enjoying Girl Guide Cookie! Show us how your inner cookie monster devours, munches or nibbles your Girl Guide cookies! 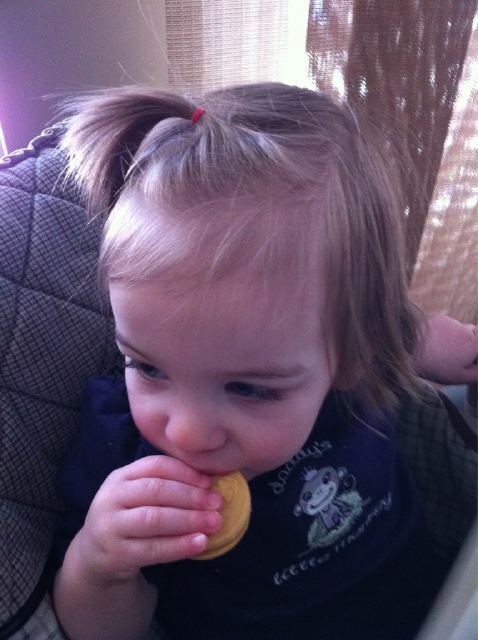 Check out a cutie enjoying her very first Girl Guide cookie. Have a comment about this post? Click the link “Leave a Comment” or “Comments” below. Comments are held in queue for moderation. We’d love to hear from you!